Thomas Jefferson was the 3rd President of the United States of America. He was elected President in 1800 and served from March 4, 1801 until March 4, 1809. He is best known for drafting the Declaration of Independence. Thomas Jefferson was born April 13, 1743 and died on July 4, 1826. He became a lawyer and worked a plantation using slave labor. He was Governor of Virginia from 1779 until 1881. Before becoming President he served as Vice President under President John Adams. This page provides links to essays on Thomas Jefferson by William P. Meyers, as well as links to external Web sites with related information. "If suffices for a man to be a philosopher and to believe that human affairs are susceptible of improvement, & to look forward, rather than back to the Gothic ages, for perfection, to mark him as an anarchist, disorganizer, atheist & enemy of the government." Thomas Jefferson, reaction to the Sedition Act, letter to T. M. Randolf, May 3, 1798. 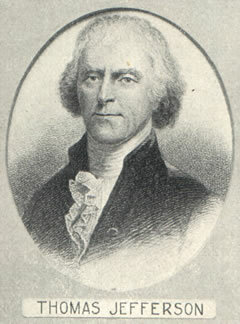 The Somersett Decision, convinced Virginia slave owners, including Thomas Jefferson, to demand independence from Great Britain.